The ways that different people learn has been an ongoing interest to educators. Individuals have different aptitudes, attitudes, perspectives, and preferred learning styles that affect the learning process. They also have different backgrounds and experiences they bring to the learning experience. These elements and factors exist no matter the age of the learner. 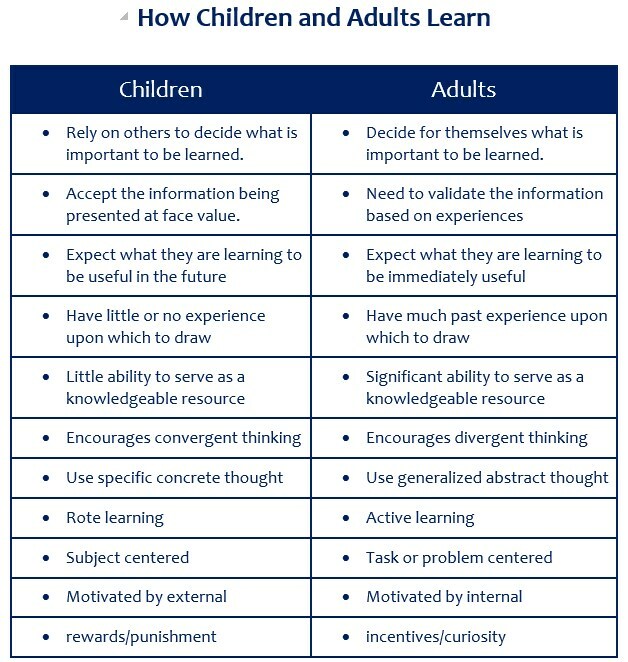 However, there can be a generalization that children and adults learn in fundamentally different ways. And by understanding how a particular segment learns, educators and trainers can design courses that will enhance the learning experience and maximize the effectiveness of the session for a particular group. It is important to note that even though the approach to teaching adults and children should be done in different ways to optimize the particular group’s learning potential, much of the basic principles of learning are the same for both groups. 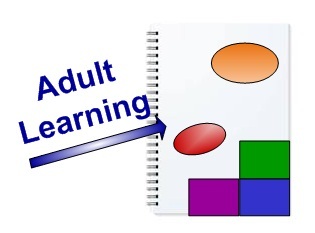 Listed below are some of the fundamental differences of children learning and adult learning. Rely on others to decide what is important to be learned. Accept the information being presented at face value. Little ability to serve as a knowledgeable resource to teacher or fellow classmates. Decide for themselves what is important to be learned. Need to validate the information based on their beliefs and experiences. Expect that what they are learning to be immediately useful. Significant ability to serve as a knowledgeable resource to the trainer and fellow learner.